Hello Good Hair Days: Customized Shampoo & Conditioner + Giveaway! When I wake up with a good hair day, everything else seems to fall into place. Hair is one of the most defining characteristics of our outward appearance. For the past year, I have been on the hunt for the best hair care products. But, it is been much harder than I expected. There are a lot of products out there. It is hard determine what all you really “need” to achieve that glorious “good hair day” status. Thankfully, a few months ago, Formulate asked me to try their customized shampoo and conditioner. I thought it might be too good to be true, but I love trying new products and new I wanted to test this out for you all. Now it’s time to share the scoop! The first step to get “good hair day” status is to take Formulate’s quiz. The quiz is where customization begins! It is your opportunity to share your hair type, needs and improvements you would like to see with your hair. Formulate’s quiz touches on every detail from length and color to strength and hydration needs. The last step of the quiz is picking out the scent – probably the hardest part for me because there were so many awesome choices! Once the quiz is done, your Formulate profile is complete. Here’s what mine looks like. If you want to see what the possibilities are for your hair in the hands of Formulate, take their quiz. Hello.. Good Hair Day? Is that you? Formulate arrived in the mail after a few days. The packaging is sleek, simple and functional. The pump is a game changer as well! The first time I tried Formulate, something was off with the formula. I was one of the first people to try the product so I wasn’t shocked. What surprised though, was the Formulate team. They genuinely wanted to help me find the right formula. My hair is very fine, color-treated and I have several hair goals. I guess you could call me a little high maintenance! But despite of that, Formulate kept working with me until I got the right formula. And let me tell you, my good hair days are no longer rare occurrences! Just as they did with me, the Formulate team promises to work with you to adjust your ingredients and ship you the new formula – free of charge. Customer service is everything and I can confidently tell you Formulate is top notch on that front! Before using Formulate, my scalp was oily and I was constantly battling build-up of dry shampoo – one of my favorite hair care products! I also had heat damage on the ends of my hair, resulting in lots of split ends. Thankfully, I no longer have those problems with my customized shampoo and conditioner. My hair is the healthiest it has been is several years. It is stronger, more hydrated, less frizzy and my hair color “stays” longer. My scalp is healthier, too. My nighttime routine of washing my hair twice a week is the same, but I am using less dry shampoo, which ultimately means more money in the bank! In addition to helping me meet my hair goals and achieve “good hair day” status, one of my favorite things about Formulate is that it is good for the environment. Their cruelty-free formula doesn’t contain preservatives, sulfates or parabens that can be harmful our planet Earth. The formula also contains less water than most shampoos and conditioners. You have to stay committed to Formulate and be patient to get see the full result. It can take a few times for your hair to fully let go of the old products you were using. Since I only wash my hair two times a week, it took me a while, plus I didn’t get the best formula for me right away. The price of for their customized shampoo and conditioner is also a little high for me, at $39 for the pair. However, now that I am spending less money on dry shampoo and have seen improvement in my hair, I can say it is definitely worth the price! Bring on the Good Hair Days! I am SO glad I stuck with Formulate and found a customized formula that fits my hair needs. It really has been a game-changer! Thanks to Formulate’s generosity, I have a GIVEAWAY for a chance to achieve “Good Hair Day” status for free! Click the link below to enter. The winner will receive a customized shampoo and conditioner set and everyone else will receive a $5 off coupon code. The giveaway closes on February 18th. The winner will receive an email and I’ll share the news on Instagram. Now, let’s chat! What does a good hair day looks like for you? How many days of the month do you achieve “Good Hair Day” status? I would love to hear about your hair care routine and if you would try customized shampoo and conditioner. Disclaimer: Formulate provided me products to try in exchange for this review. All the opinions and thoughts I share are my own, unless stated otherwise. I only share content that I have a personal connection with. Your clicks, comments and engagement are very much appreciated, and may allow me to receive a small compensation. 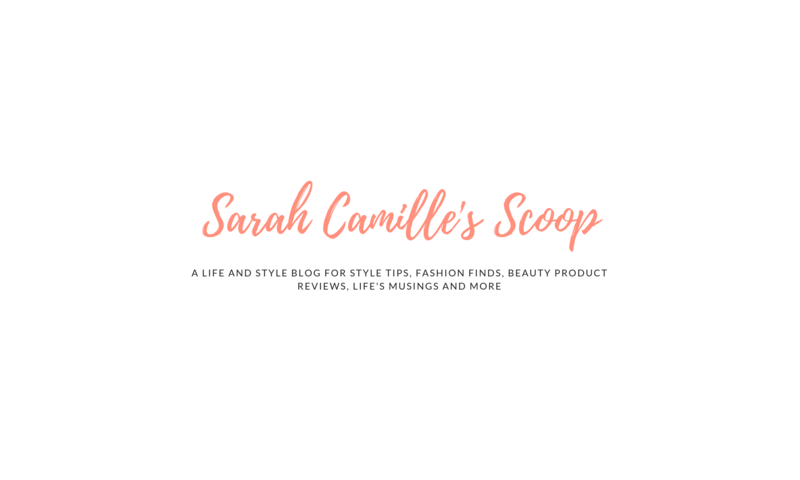 Your support of Sarah Camille’s Scoop and the brands I share help me keep doing what I love — and for that I am so grateful! Dry shampoo is the holy grail of my beauty routine. If you haven’t heard, it saves you from washing your hair everyday and keeps your hair from looking oily. I have tried a handful of dry shampoo products, but one has continued to go above and beyond what the other dry shampoos do! Dove’s Refresh+Care Dry Shampoo is the best. Seriously. This stuff is a game changer. It does not build up in your scalp like some similar products. The smell is light and not overwhelming. The product itself goes a long way and the dry shampoo doesn’t weigh your hair down. If you’re thinking about trying a dry shampoo routine, do it! It is definitely worth trying out. When I add up the time throughout one week that I’d be drying my hair if I did not use dry shampoo, it adds up to about 90 minutes. This time back is huge, especially if you are not a morning person and you can sleep in a little longer! My hair styled with Dove’s Refresh+Care Dry Shampoo for my cousin’s wedding in August. I have even grown to prefer the texture of my hair when it is on day one or two of dry shampoo. My hair’s easier to style and often looks fuller with dry shampoo in it. I even find my hair holds curl better when it has dry shampoo in it – is that just me?! It worked great for me when I curled my hair for my cousin’s wedding in August (pictured above). I’d love to know if you use Dove’s dry shampoo as well and how you like it. I hope your week is off to a great start too. I’ve been sick today but am thankfully starting to feel better. So, stay tuned for some fun posts later this week.